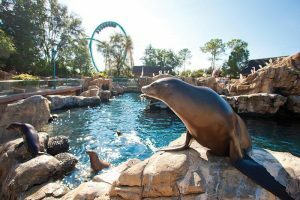 SeaWorld® Orlando is one of three fabulous locations operated by America’s only aquatic mammal theme park chain. It draws nearly four million visitors a year. Some come for the up-close and personal educational experience with the park’s marine life. Meanwhile, the thrill-seekers come for the hair-raising rides. There are 200 acres of sea-inspired rides, shows, and animals to keep everyone entertained. A day at an amusement park can come with a steep price tag, but aRes Travel offers numerous money-saving options with savings that are even better than those found with SeaWorld® Orlando tickets, discount coupons! While the famous orcas steal the show at SeaWorld® Orlando, there are also plenty of live shows and educational opportunities putting other incredible species front and center such as wild birds, sea lions, and dolphins. “Clyde and Seamore’s Sea Lion High,” for example, is a show featuring sea lions and walruses. The indoor “Pets Ahoy” features smaller domestic animals like dogs, cats, birds, and even pot-bellied pigs! The big shows have “splash zones” up front for people who want to cool off with a soaking from a whale’s splashing tail. SeaWorld® Orlando also actively participates in rescuing endangered manatees in Florida. After nursing them back to health, they return the manatees to their natural habitat. Other animals featured at SeaWorld® Orlando include several types of sea turtles, pelicans, flamingos, and alligators. For the thrill-seekers, the park offers among some of the most unique — and of course, sea-inspired — rides in America, such as the Kraken®, a floorless roller coaster. Manta® takes visitors on a ride that mimics the movement of a manta ray in the ocean. Expect to get wet riding the Journey to Atlantis® and Infinity Falls, two exhilarating water rides. There are areas for younger visitors, including Shamu’s Happy Harbor, which features a splash pad, kiddie rides, and a climbing net. 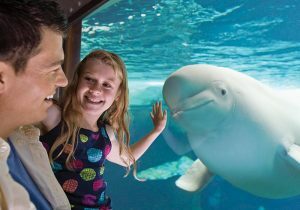 For exclusive deals on SeaWorld® Orlando tickets discount coupons, some of the lowest prices on packages, hotels, and amazing savings on travel, call 1 (800) 434-7894 (international callers use +1 (619) 546-5622) to speak with an aRes Travel planning expert seven days a week, or book online now.